Having lived in several different parts of this city over the past 2 years, I’ve stumbled across some hidden gems when it comes to the best places in town to grab a bite to eat. From coffee and bagels to a full dinner, I’ve got you covered. Stick with me to find out my four favorite places to eat in Nashua. First, and by far my favorite is What-a-bagel. As you may have guessed, this is a bagel (and coffee) place. Located on East Hollis Street in downtown Nashua, What-a-bagel became at least a weekly outing for me after I took my first bite. There are about 20 bagel varieties to choose from, all New York style water bagels. The bagels at this place are exactly what you want- just a slight crunch from the toaster on the outside, and warm and fluffy perfection on the inside. Aside from all the expected flavors, there are other options to choose from like banana chocolate chip, jalapeño cheddar, cinnamon sugar, rosemary garlic and olive oil, and of course the highly sought after rainbow bagels. They have some creative sandwich combos if you desire as well. My personal go-to is a Western Sandwich on jalepeño cheddar toasted bagel with pepper jack cheese. They also have some decent coffee if you want to wash down whatever creation you decide to tackle. My one tip would be to try to get there early on the weekend around 7-8 to beat the rush. Since it’s a small place it tends to fill up in there pretty quickly. Bonhoeffer’s is a unique, cozy café situated right off of Main Street on the opposite side of the road from the Peddler’s Daughter. They serve some great breakfast options, really good coffee, and the best part: crepes. I have two favorites here that I highly recommend. First, is the Greek breakfast sandwich that comes with egg, spinach, feta, and tomato on scrumptious, fluffy ciabatta bread. Next is the Nutella Crepe. It’s just Nutella, whipped cream and chocolate drizzle but it is more than satisfying. They have about a dozen crepes to choose from including flavors like German Pancake (fresh lemon and confectioners’ sugar), cinnamon roll, and even garden vegetable if that’s more your style. The food here is great and the environment really makes it. It’s set in an old mill-style building with exposed brick and super high ceilings. They have some nice leather furniture you can sit on with a fire place which is perfect for fall and winter. There are also plenty of tables to sit at, as well as free Wi-Fi if you need to get some work done while you eat your crepe and sip your coffee. Although much more well-known than other places on the list, it felt wrong to leave Pressed Café out. My friends and I have probably spent enough money here in the last five years to be 50% stakeholders in the company. Pressed has a huge menu, including awesome breakfast burritos, mac ’n cheese, and of course Paninis. Some of my favorites here include: the chipotle steak and egg burrito, buffalo mac, the Middle East Panini, and the peanut butter power smoothie. They also do all kinds of fresh pressed juices and smoothies using market fresh ingredients. I encourage you to check out the huge menu here. This is another place that can get very busy at peak times, mostly lunch time. They also have a drive thru around back that I highly encourage you to utilize if you are there around lunch, as it’s much more pleasant to wait in the comfort of your car than to be body to body with a bunch of people waiting for their food. La Carreta is hands down the best place I have ever been to get authentic Mexican cuisine and drinks. From the first bite of amazing house made chips and salsa, to the last bite of the perfectly sweet flan, I always enjoy it here- and so does my wallet. You can easily get out of here having an entrée and a couple of margaritas for less than $30 per person. My favorite meal here is the Chilaquiles Verdes, washed down with an Iguana Margarita. This dish is essentially just their deliciously seasoned ground beef (or chicken or pork) atop the freshly made tortilla chips, smothered in the Verde sauce which is a perfect blend of spicy and tangy. They have a very big, very easily customized menu making it easy for almost anyone to find something they like. The staff is always very fun and eager to accommodate you. There is almost always a wait during dinner hours, so I encourage you to plan accordingly. 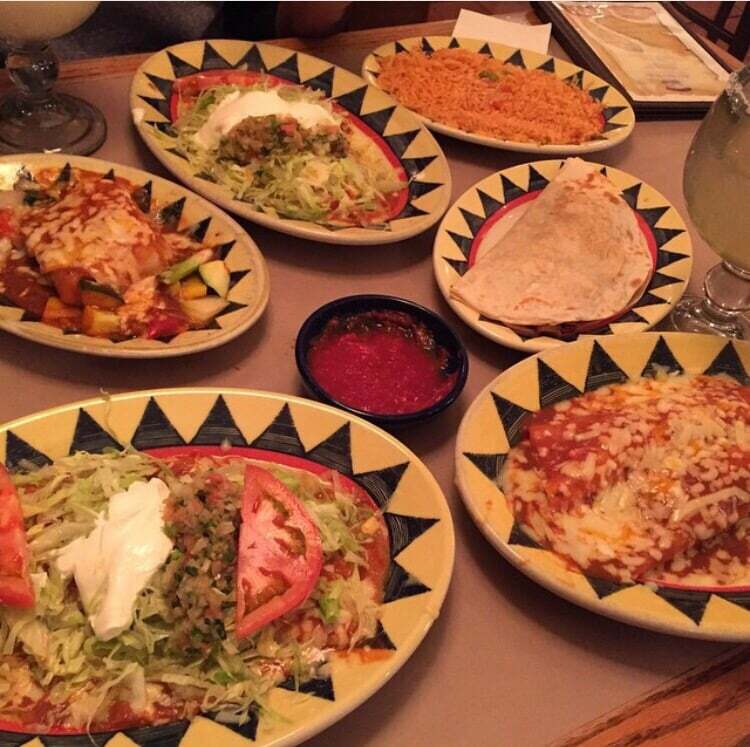 Tip- Order the queso to accompany your chips and salsa, you won’t regret it. If you’re from the Nashua area, odds are you’ve heard of at least a couple of these places but hopefully you found out something new. If you’re new to the area or just visiting, welcome! Enjoy these 4 eateries in Nashua you must try!